I like this French Provincial Jewelry Organizer made by Mel-Designs. It is lovely and it features quotes. I like quotes! 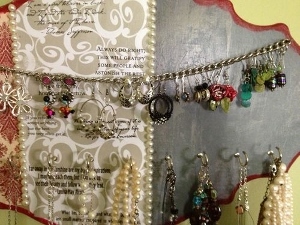 In this tutorial Mel shows how she used recycled jewelry chain, cup hooks, and pearl beads to make this earring and necklace jewelry holder. Check it out!